Of all the items to enter culinary fad territory during the last few decades, ramen has been most resistant to being upscaled into silliness. Burgers are sprinkled with caviar, pizza topped with quail sausage, sushi rolls stuffed with foie gras, but somehow ramen just stays its honest self. It can’t be that nobody has considered adding all sorts of trendy ingredients, because nothing escapes that experimentation in the current environment. I think it’s partly a matter of aesthetics. If you want something wacky you don’t order comfort food noodle soup, and partly because there are so many variations in the traditional versions that nobody sees a need to invent another one. There are subtle innovations at many places, but never anything that would violate the basic concept. These thoughts wandered through my mind during a meal at Rakkan Ramen, the Japanese noodle soup specialist that opened in July on Pacific Coast Highway in Redondo. 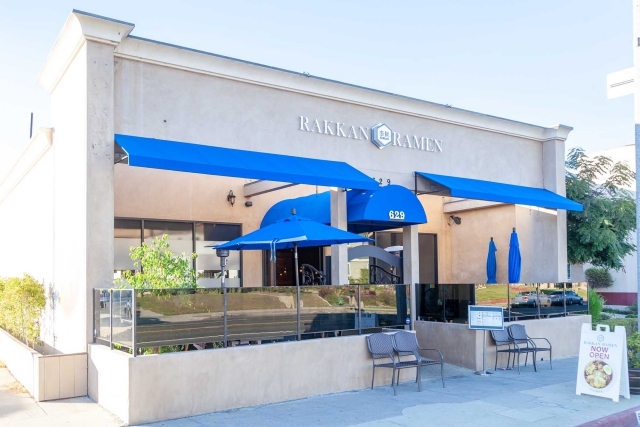 Rakkan is the second location in the U.S. of a Japanese chain that started as a four-seat restaurant in Tokyo in 2011. When a place grows that fast you figure they have something going for them, and they do. The noodles are freshly made but otherwise standard, the add-ins of roast pork, green onion, bamboo shoots and the like, high quality but otherwise standard. The broths are what stands out. There are several regional varieties in Japan, but most restaurants offer only one or two. All traditional versions are heavy on seaweed, dried fish, and miso soybean paste to create a rich umami flavor, but at Rakkan are almost all available in vegan versions. I’ll get to those in a minute, but first I need to mention a bit about the environment and the available starters. The restaurant is paneled with dark wood and is otherwise almost undecorated, which looks handsome by day but makes the place rather dark in the evening. The lighting is kept low. I saw people using their cellphones to read the menu and look at the pictures of food. The music level is moderate but it’s a lively room, so conversation is possible if you don’t mind some background noise. A few starters are offered, and I have tried the eggplant salad and shrimp shumai. The shumai were a particularly good rendition of the dim sum favorite, chopped shrimp in a translucent noodle skin. At a Chinese restaurant these would have been served just with hot mustard, but here they came with a few leaves of what looked like chard, a bowl of sesame, vinegar, and green onion dip, and a small dab of very spicy horseradish mustard. There are five to an order, and if you are wary when it comes to deploying the mustard you’ll find much to like. The eggplant salad was even better, the vegetable wok-fried without batter and tossed with onions and a dash of white sesame seeds. The same vinegar dip was provided along with a mild ginger sauce, and I slightly preferred the ginger. Crispy chicken is also offered as an appetizer, but as all ramen orders offer the option of getting a rice bowl on the side and one topped with crisp chicken was an option, we went with that. It’s good battered and fried chicken but nothing extraordinary. Other options for combos include a fried pork bowl, which we tried, and a vegan avocado-tofu bowl, which we didn’t. I rather wish I had ordered that, because the one I saw on another table looked delicious and it would have been a more interesting contrast with the noodle soups. The ramen bowls all include freshly made springy noodles with green onion and bamboo shoots, and what else is in there depends on which variety you order. I have tried bowls with soy sauce-based broth with dried kelp and bonito, spicy miso with garlic and black and red pepper, and shrimp miso with sesame paste. That last item has a novel preparation, as the shrimp is slow cooked in olive oil, a Mediterranean ingredient not usually found in Japanese cooking. I can’t say I tasted any distinct olive oil flavor, but that’s a subtle thing and like most Japanese flavors this was delicately flavored. So was the broth that was labeled as spicy, because it was spicy only by Japanese standards. The vegetable-based broth was very richly flavored and you could tell that the peppers and garlic were in there, but they were an element of a flavor without dominating it. This was appreciated because particularly good sesame paste-roasted pork was also an ingredient, and it would have been a shame to overwhelm it. As much as I liked the others, their version of soy sauce ramen might be my favorite. This stock uses a little dried sardine along with the standard dried bonito and soy to develop a pleasantly salty tang, and it’s a great version of a classic. I intend to try the other two varieties of stock, but this is the one I expect to come back to. Soft drinks are offered, but we decided to have green tea and split a small bottle of Yaegaki sake. I had ordered this American rice wine because I hadn’t tried it before, and we found it to be light and slightly fruity but to have little character. It’s okay and moderately priced but not impressive, and there are others in their collection that I’d recommend more highly. A filling dinner for four with an $11 sake ran $99 and offered a considerable variety of flavors, highlighting one of the other virtues of ramen: because people haven’t fancified it, it’s usually moderately priced. 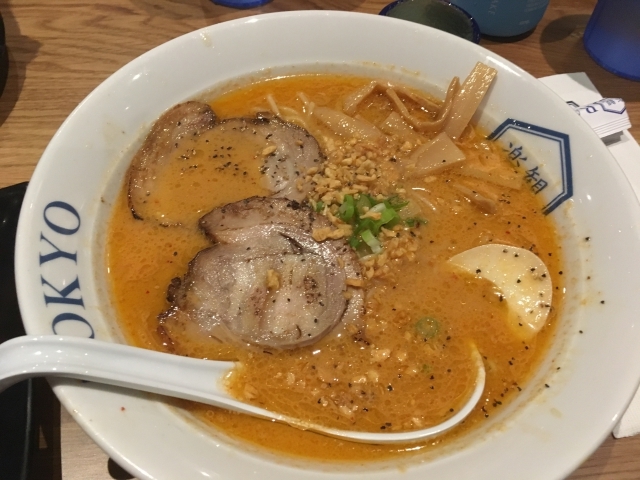 Rakkan offers a fine experience at excellent value, and if a bowl of noodles sounds great right now, it’s the place to go.